Predators of a variety of arthropods including spiders (Aranaea), cockroaches (Dictyoptera), grasshoppers (Orthoptera), and caterpillars of moths and butterflies (Lepidoptera) or larvae of other wasps (Hymenoptera). Most species mass provision their nest with prey items on which they lay a single egg, however, some sphecines rear multiple larvae in a single cell. Nests are either constructed from mud or rarely resin, or are created by burrowing in the soil. Pre-existing cavities are also used as nesting sites. Arnold, G. 1920. A revision of the South African species of the genus Sphex Linn. (olim Ammophila Kirby). Proceedings of the Rhodesia Scientific Association 18 (2):25-55, 2 pls. Arnold, G. 1922. The Sphegidae of South Africa. Part I. Annals of the Transvaal Museum 9:101-138. Arnold, G. 1923a. The Sphegidae of South Africa. Part II. Annals of the Transvaal Museum 9:143-190, pl. V.
Arnold, G. 1923b. The Sphegidae of South Africa. Part III. Annals of the Transvaal Museum 9:191-253. Arnold, G. 1923c. The Sphegidae of South Africa. Part IV. Annals of the Transvaal Museum 10:1-58. Arnold, G. 1924. The Sphegidae of South Africa. Part V. Annals of the Transvaal Museum 11:1-73, pl. I-II. Arnold, G. 1925. The Sphegidae of South Africa. Part VI. Annals of the Transvaal Museum 11:137-175. Arnold, G. 1926. The Sphegidae of South Africa. Part VII. Annals of the Transvaal Museum 11:338-376. Arnold, G. 1927. The Sphegidae of South Africa. Part VIII. Annals of the Transvaal Museum 12:55-131. Arnold, G. 1928a. The Sphegidae of South Africa. Part IX. Annals of the Transvaal Museum 12:191-232, pl.VIII. Arnold, G. 1928b. The Sphegidae of South Africa. Part X. Annals of the Transvaal Museum 12: 233-279, pls. IX-XI. Arnold, G. 1928c. The Sphegidae of South Africa. Part XI. Annals of the Transvaal Museum 12:338-375. Arnold, G. 1929a. The Sphegidae of South Africa. Part XII. Annals of the Transvaal Museum 13:217-319. Arnold, G. 1929b. The Sphegidae of South Africa. Part XIII. Annals of the Transvaal Museum 13:320-380, pl. VI. Arnold, G. 1929c. The Sphegidae of South Africa. Part XIV. Annals of the Transvaal Museum 13:381-418, pls. VII-VIII. Arnold, G. 1931. The Sphegidae of South Africa. Part XV (conclusion). Annals of the Transvaal Museum 14:135-220. Arnold, G. 1932. New species of Ethiopian Sphegidae. Occasional Papers of the Rhodesian Museum 1:1-31. Arnold, G. 1933. Entomological expedition to Abyssinia, 1926-7. Hymenoptera, II. : Sphegidae and Psammocharidae. With an introductory note and supplementary list by Hugh Scott, Sc. D. The Annals and Magazine of Natural History (Series 10) 11:351-371. Arnold, G. 1935. Scientific results of the Vernay-Lang Kalahari expedition, March to September, 1930. Sphegidae and Psammocharidae. Annals of the Transvaal Museum 16: 497-505. Arnold, G. 1945 (1944). The Sphecidae of Madagascar. Cambridge University Press, Cambridge. 193 pp. Arnold, G. 1951. Sphecidae and Pompilidae (Hymenoptera) collected by Mr. K.M. Guichard in West Africa and Ethiopia. Bulletin of the British Museum (Natural History). Entomology 2:95-183. Arnold, G. 1960. Aculeate Hymenoptera from the Drakensberg Mountains, Natal. Annals of the Natal Museum 15: 79-87. Cameron, P. 1910. On the Aculeate Hymenoptera collected by Mr. A.J.T. Janse, Normal College, Pretoria, in the Transvaal. Annals of the Transvaal Museum 2:115-154. Dahlbom, A.G. 1845. Hymenoptera Europeae praecipue borealia, I, 3. Tabula Examinationis Synoptica Speciorum Pompilidarum 1845: 410-465. Dollfuss, H. 2013. Revision of the wasp genus Ammophila KIRBY 1798 (Hymenoptera: Apoidea: Sphecidae) of the Palearctic Region and India. Linzer biologische Beiträge 45 (1): 383-564. Dollfuss, H. 2015. Revision of the wasp genus Ammophila KIRBY, 1798 (Hymenoptera: Apoidea: Sphecidae) of the Sub-Saharan Region of Africa. Linzer biologische Beiträge 47: 307–412. Dollfuss, H. 2015. The Ammophilini wasps of the "Biologiezentrum Linz"- collection in Linz, Austria (part 3) including the genera Ammophila KIRBY, Eremnophila MENKE, Eremochares GRIBODO, Hoplammophila de BEAUMONT and Podalonia FERNALD (Hymenoptera, Apoidea, Sphecidae). Linzer biologische Beiträge 47: 413–439. du Buysson R. 1898. Voyage de M. E. Simon dans l'Afrique australe (janvier-avril 1893). Annales de la Société Entomologique de France 66: 351-363, pl. 11. (volume dated 1898, but reprints dated 1897). Gribodo, G. 1894. Hymenopterorum novorum diagnoses praecursoriae. I. Miscellanea Entomologica. Nuntius Entomologicus Internationalis 2: 2-3 French, 4-5 German. Kohl F.F. 1884 (1883). Neue Hymenopteren in den Sammlungen des k. k. zool. Hof-Cabinetes zu Wien. II. Verhandlungen der kaiserlich-königlichen Zoologischbotanischen Gesellschaft in Wien 33: 331-386, pls. XVIIa-XVIII. Kohl F.F. 1901. 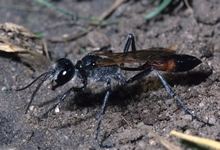 Zur Kenntnis der Sandwespen (Gen. Ammophila Kirby). Annalen des k.k. Naturhistorischen Hofmuseums 16: 142-164. Leclercq, J. 1955. Hymenoptera Sphecoidea (Sphecidae I. Subfam. Sphecinae) in Exploration du Parc National de l'Upemba. I. Mission G.F. de Witte en collaboration avec W. Adam, A. Janssens, L. van Meel et R. Verheyen (1946-1949), Fasc. 34: 1-137. Menke, A.S. 1966. The genera of the Ammophilini (Hymenoptera; Sphecidae). The Canadian Entomologist 98: 147-152. Morawitz F. 1889. Insecta, a Cl. G.N. Potanin in China et in Mongolia novissime lecta. IV. Hymenoptera Aculeata. Horae Societatis Entomologicae Rossicae 23: 112-168. Nurse C.G. 1903. New species of Indian Aculeate Hymenoptera. The Annals and Magazine of Natural History (Series 7) 11: 511-526. Nel, E., Kelly, J. & Dippenaar-Schoeman, A.S. 2014. Notes on the biology of the wasp, Chalybion spinolae (Hymenoptera: Sphecidae), an obligatory predator of Latrodectus (Araneae: Theridiidae) spiders in South Africa. Journal of Natural History 48: 1585-1593. DOI:10.1080/00222933.2013.877993. Palisot de Beauvois A.M.F.J. 1805-1821. Insectes recueillis en Afrique et en Amérique, dans les royaumesd’Oware et de Benin, à Saint-Domingue et dans les États-Unis, pendant les années 1786-1797. Imprimerie de Fain et Compagnie, Paris. XVI + 276 pp, 90 pls. Taschenberg E.L. 1869. Die Sphegidae des zoologischen Museums der Universität in Halle. Zeitschrift für die Gesammten Naturwissenschaften 34: 407-435. Turner R.E. 1919. Notes on fossorial Hymenoptera. XXXVIII. On new Ethiopian species. The Annals and Magazine of Natural History (Series 9) 4: 44-50. Photographs © Simon van Noort or Norman Larsen (Iziko Museums).